Oconee State Bank is in my blood. From when I joined the junior board in 1992 to today – nearly 26 years later – I have had an account at the bank. My wife – who served with me on the junior board – has done her banking at Oconee State Bank even longer — for more than 40 years. For 58 years, Oconee State has created opportunities for individuals and businesses to borrow and bank locally, and to keep their deposits in the area to support others in the community who want to grow with our region. In fact, if you research Oconee County institutions, you won’t find many that bind our community in the way that Oconee State Bank does. 1) People still like to visit a branch: I was amazed by the number of visitors going in and out of the branch. Kids, parents, young, old, working and retired. At Oconee State, they know they will be greeted by a smile (often by name) and receive friendly, prompt service. Cookies, (good) coffee and lemonade are always there to polish off their visit. 2) Generosity is not a function of prosperity: As visitors started filing by our lemonade stand, Rebecca would explain that she was raising money to send kids to ESP’s summer camp. The contributions ranged from less than $1 to more than $100. But what struck me was not the generosity of those in expensive new vehicles, but of those who likely had less to give, but understood the deep need of those in our community who have less opportunity. Oconee County citizens have a history of quietly supporting those in need without seeking any recognition, and it was inspiring to see this community spirit in action. 3) Our citizens want to feel connected: Many of our visitors knew all about ESP. Many others knew nothing. But almost every one of them took time to talk to Rebecca and understand a little bit more about one of our state’s most remarkable not-for-profits, which operates quietly just down the hill from downtown Watkinsville, actively transforming the lives of kids and young adults with disabilities from across the region. Over the past year, Oconee State Bank has refocused its mission around creating remarkable experiences for its customers, employees, and shareholders. 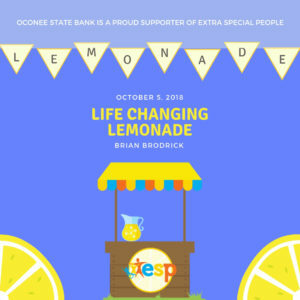 On that Saturday morning, Oconee State didn’t just create a remarkable experience for my daughter, who sold a lot of lemonade and raised more than $600 for ESP. The bank, its customers and employees created the opportunity for at least two children to experience summer camp at ESP, likely one of the most remarkable moments of their life. This isn’t the sort of experience that happens on a phone app or website (although Oconee State has both) or with a national bank. This happens when your bank knows its community and its customers, and cares deeply about them both. Enjoyed the Article…and memories of the writer from the days of Junior Board to the present! OSB is my bank….of friendly service! Person service can’t be replaced by a mobile phone! I love working for a bank that is community driven!